On a physical afternoon at Mill Farm, the Coasters came away with all three points thanks to a quick-fire double within the closing stages of the game. Both teams came into it very much needing a win; the Coasters having suffered back-to-back defeats for the first time since February, whilst Boreham Wood were winless in five, and eager to rectify their away form. Fylde made one change from the defeat to Dagenham & Redbridge, as Zaine Francis-Angol came back from international duty and in to replace the injured Andy Bond, who limped off with a strain in East London. The Wood made two changes to the team that drew at home to Ebbsfleet, as top scorer Umerah returned from the bench in place of Shaibu, whilst Manny Parry replaced the suspended Dave Stephens. The visitors started the game brightly, looking to find their two attackers, Umerah and Ugwu, in pockets of space. After eight minutes, they did just that, Umerah nestling his way goal-side of Tunnicliffe and clean through on goal. Tunnicliffe’s attempts to retrieve the ball saw Umerah falling to the floor, but referee Andrew Miller decided there was no infringement on the attacker. The Coasters breathed a collective sigh of relief, as it would most certainly have seen Tunnicliffe given his marching orders should the referee have deemed it a foul. This shook Fylde into life, and with Toure playing through the middle of a front three, they looked to cause problems with his direct style of play. Danny Rowe, working hard out right, dispossessed left-back Ilesanmi, before weighting a cross into the box aimed at Toure. It missed its intended target, but Haughton and Francis-Angol were alert to recycle it, and with quick passing freed themselves space, finding Toure at the front post. His effort, however, was affected by Hoddart’s attempt to clear the ball, which led to Toure being hauled off the pitch with his white shirt covered in blood. Undeterred, Toure returned to the pitch with a clean, numberless shirt, and continued to make himself a nuisance. The Coasters best chance of the first half came after great work from Toure on the left side released Francis-Angol, who found Haughton eight yards from goal. Haughton’s side-footed volley lacked the conviction to beat Hoddart, but the explosive nature of the move boded well for Fylde. Just after the half-hour mark, the Coasters could have found themselves ahead. Rowe, wriggling free on the right-hand side, fizzed a ball across the face of goal towards Danny Williams. Williams was at full-stretch, but found his goal-bound effort diverted behind for a corner. The first-half continued with Fylde on top, in part thanks to the tireless Croasdale in midfield. Breaking up Boreham Wood’s attacks and ensuring his presence was felt against a physical side was key to Fylde’s positivity, continually driving the team on from the middle of the pitch. If the first half was a little cagey, the second half was anything but. Much like the first-half, Boreham Wood started the better of the two sides, with a crucial chance presenting itself just three minutes in. A pin-point delivery from a free-kick found Fyfield unmarked, but his header veered into the side-netting. A dangerous spell followed for the Coasters, as Gime Toure was afforded his best chance of the game 10 yards from goal – but his effort from William’s cutback was slightly nonchalant, and was palmed behind for a corner. This set-up arguably the best moment of quality in the game, as a corner was cleared to the edge of the box, which Danny Rowe pulled down, before unleashing a left-footed half-volley on the turn, which clipped agonisingly off of the crossbar. 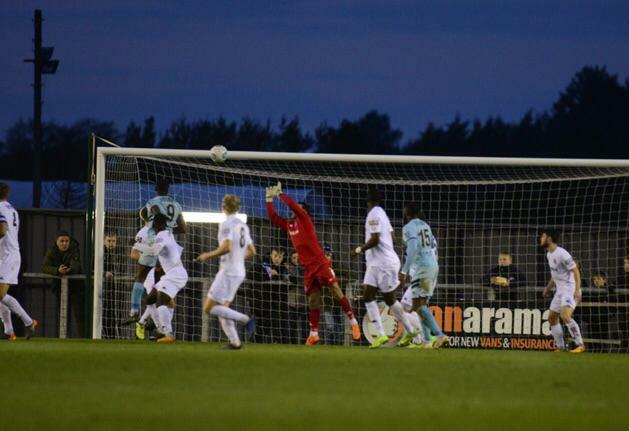 Boreham Wood’s best spell of the game followed, as chances for Ugwu and Fyfield presented themselves, with the latter forcing Jay Lynch into a great two-handed save to keep the scores level. The visitors continued to push, and on the 58th minute, a training ground routine seemed to be the undoing of Fylde. A simple feet-and-back throw in between Murtagh and Woodwards allowed the latter to swing a speculative ball into the box, which Ugwu was alert to, nipping beyond the central defenders and steering home. Having not had the best results on the road so far, the Wood seemed to be in control, and hopeful of taking all three points back to Hertfordshire. Not content with how his side was responding to going behind, Challinor made three substitutions; first Tasdemir for Williams, before the double substitution of Hemmings and Kellermann ten minutes later, replacing Toure and Philliskirk. The substitutions seemed to have the desired effect, as just four minutes later, Nick Haughton found himself in space on the edge of the box, skipping past a challenge and unleashing a ferocious effort just wide of the right-hand post. Buoyed by this sight of goal, Haughton was instrumental in the equaliser, picking up the ball on a quick counter-attack, traveling forward with it, before sliding in Danny Rowe. Mill Farm held its breath as the hitman sized up his opponent, cutting sharply in onto his left, before curling it beyond the helpless Hoddart. To those Coasters fans looking on, the point would probably have seemed a fair reward for their side’s efforts, but Serhat Tasdemir had other ideas. Latching onto Hemmings lay-off, Tasdemir fired a low, powerful effort beyond the goalkeeper just one minute after the previous goal, which sent the Fylde faithful crazy. As the clock ticked down, and the Coasters edged closer to three points, the Wood made one final change, throwing on Sorba Thomas in place of Woodwards. It was too late however, and AFC Fylde were able to see out the game, snatching three points from what looked to be a defeat in 60 seconds of potency. Manager Dave Challinor, who referred to Boreham Wood as a bogey team prior to the game, was honest in his assessment of his side’s performance. Watch Chally’s full interview here. AFC Fylde – 433; Lynch, Francis-Angol, Tunnicliffe, Byrne Burke; Croasdale, Philliskirk (81’ Kellermann), Haughton; Williams (’67 Tasdemir), Toure (81’ Hemmings), Rowe. Subs not used: Birch, Brewitt. Boreham Wood (352): Huddart; Champion, Fyfield, Parry; Woodards ( ’89 Thomas), Ricketts, Shakes, Murtagh, Ilesanmi; Ugwu, Umerah( 75’ Shaibu). Subs not used: Ash, Smith, Burbidge.